Pluto and Proserpina is a stainless-steel sculpture that stands over 10 feet tall created by iconic American artist Jeff Koons, which is installed in the central heartbeat of Oceana Bal Harbour, gracing the buildings soaring outdoor breezeway that connects the Atlantic Ocean with vibrant Collins Avenue. Estimated to become one of the most valuable pieces of art ever created by Koons, Pluto & Proserpina made its debut at the Whitney Museum in New York City in June 2014 as part of the opening of Koons’s highly publicized exhibit, Jeff Koons: A Retrospective. The piece followed the exhibit on a tour to be enjoyed by millions of people at first-class museums all over the world, only to come home to Oceana Bal Harbour in 2016 for the residents who get to call it their own. 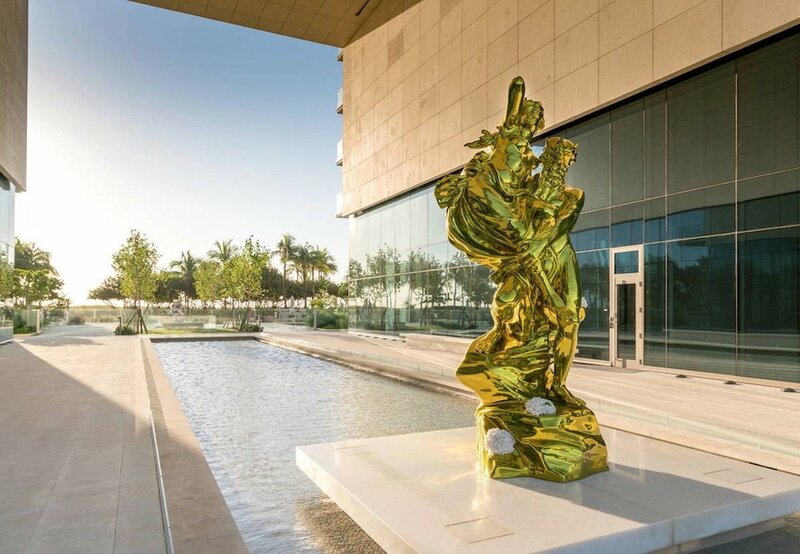 The larger-than-life sculpture was purchased by revered real estate magnate and Museo de Arte Latinoamericano de Buenos Aires (MALBA) museum-founder, Eduardo Costantini, for the residents of Oceana Bal Harbour. Costantini loaned the sculpture to the Whitney Museum, the Centre Pompidou Paris and the Guggenheim Bilbao. This marks the first time that a world-class work of art owned by residents of a development project was on loan for a global exhibition. The piece is part of Jeff Koons’s acclaimed Antiquity series and is based off a porcelain sculpture of Pluto and Proserpina from the late 1700s in France. The artist embellished the sculpture with live flowering plants, emphasizing the relationship between life and art.